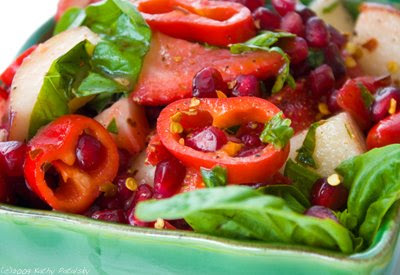 Recipe: Super Rouge Red Salad. Power Color: Red. 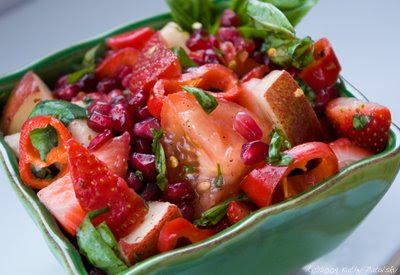 Whenever I'm eating a pasta, veggie or fruit salad, it's always the red ingredients that makes my mouth water most. 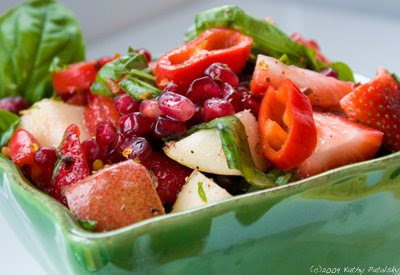 The cherry on top, the strawberry slice, the bright red tomato in my salad, or the red pepper flakes on my pizza - I'm ready for red. Power Color: Red. 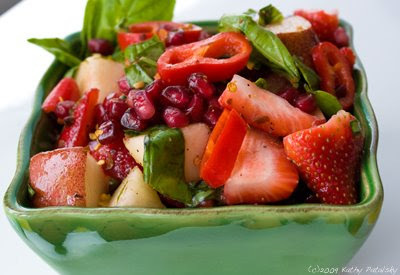 So since I've had so much fun doing a Spring Green Fruit Salad, Winter White Salad, Surfer Sunrise Golden Salad and Power Purple Salad - I decided to create a delicious salad featuring a few of my favorite red ingredients. 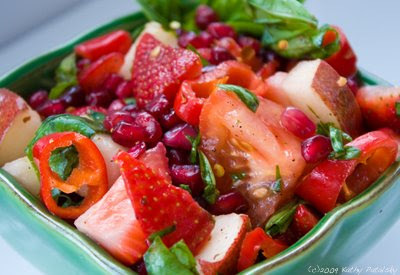 Red Antioxidants. 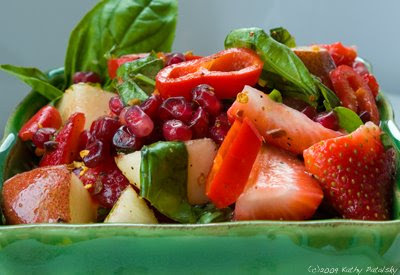 Red fruits and veggies are rich in antioxidants due to the dark red pigment colors. 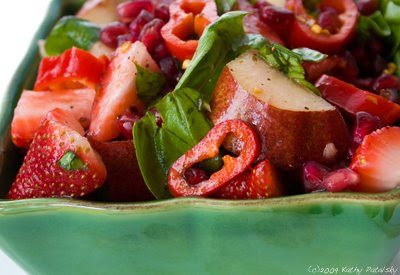 Buzz word: Phytochemicals. 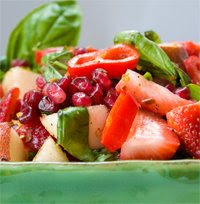 Berries are one of the highest ranking food varieties for-antioxidant power. 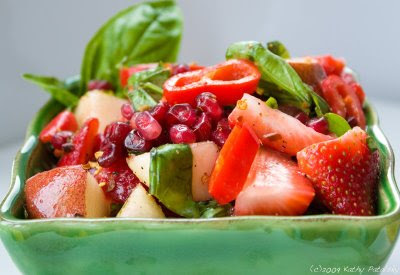 And most berries are red. Ripe'n Rouge. 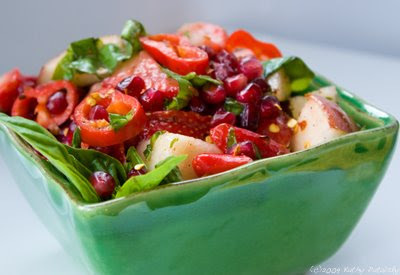 The red ingredients in this salad include sweet strawberries, tangy pomegranate seeds, ripe tomatoes, crispy baby bell peppers, red-skinned pears, red wine vinegar and some green sweet basil. Red Red Menu. 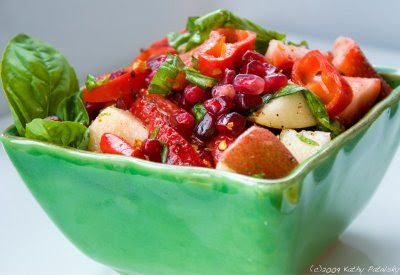 This salad is incredibly versatile: Serve it on toast as a red bruschetta, serve it over a green salad, fold in some Veganaise for a creamy side dish or eat it as is for some royal rouge refreshment.